I’m a bit overwhelmed. And I must confess that I’m wearing a sari not so much to signal ethnic pride than to conceal the knocking of my knees. First of all, I must express my immense gratitude to the board of the National Book Critics Circle. To be acknowledged by my gurus, by writers I so respect, is an unprecedented thrill. And to be in the company, if only for a moment, with the finalists—Sarah L. Courteau, William Deresiewicz, Ruth Franklin, Kathryn Harrison—tremendous artists, all—leaves me on the verge of a swoon. Honestly, I’m less delighted than disbelieving. I haven’t been sleeping so well. I’ve been having nightmares of a bacon-clad Ron Charles trying to reclaim the award and prying it out of my presumptuous little paws. It’s customary for the Balakian winner to share some of his or her ideas about book reviewing, to make a soothing speech about why reviews are useful and necessary and will survive. It’s the kind of speech I’m frankly pretty lousy at because 1.) I’m not very soothing and 2.) I hate the criteria. Utility, necessity, longevity—that’s not our bailiwick. Orthodonture is useful. A functioning judiciary and sewage system are necessary—and even in their absence, cities thrive (c.f. New Delhi). The book review belongs to the province of pleasure. It directs readers to ideas that will stretch their sensoriums, that will give them a gladness, an exquisite fright or sorrow. And of course, our most skilled practitioners in this business of bliss produce reviews that are a veritable education, reviews that remind of me nothing so much as Eadward Muybridge’s photographs of the horse running, the gymnast leaping–those photographs that isolated locomotion, frame-by-frame. That’s what Daniel Mendelsohn or Sam Anderson (both Balakian winners, I realize) do for me. Their reviews show me how a mind moves. How it gathers itself, pounces, pivots, preens, reconsiders, repents, creeps to a conclusion. A review is someone performing thinking, and our finest reviewers are, to my mind, no less remarkable than our finest athletes: what do they do but exercise their precision, subtlety, and stamina for our enjoyment? With such a mandate, to be a dealer of delight, it’s a pity that much of the news from the world of reviews—if there is news—tends to be bleak. Review space continues to contract; we’re finding out that women and people of color are given as short shrift here as they are everywhere else. The conversation about books has shifted from what we’re reading to whether we’re reading, and how. For me, reviewers are the stay against that sea of dullness. Book reviews ask the crucial questions, the harder questions than Nook vs. Kindle: how do these curious symbols in their shifting arrangement unravel us? What sleight of hand is this? Sinclair Lewis wrote, “Every compulsion is put upon writers to become safe, polite, obedient, and sterile.” I think this is doubly so for critics, but online and in our magazine and newspapers, I see only risk and energy. For all the agon of the year, let us not forget that 2010 gave us Meghan O’Rourke on Anne Carson’s Nox, Dwight Garner on Roland Barthes’ A Mourning Diary, and Sam Anderson on Martin Amis’ The Pregnant Widow. My hope is that in the reliable excitement of anxiety, we won’t forget to marvel at the engagement and intensity of the work being done right now. My hope is that we ask different questions about book reviewing, more interesting questions than do reviews matter and will they last. My hope is that we will remember that criticism is an art not a science. I realize that this was actually quite a soothing speech indeed (she says, reviewing her speech as she delivers it). And I’m sure a large part of my dogged optimism comes from the good people I work with. I’d like to thank my colleagues at Publishers Weekly for always asking the right questions. I’d especially like to thank my coworker and confessor, Craig Teicher, a brilliant poet and better friend, who two years ago shuffled up to my desk, sort of tugged at his beard, and asked me what I was doing with my life and my time and my mind. I think I made some sort of terrified mewing sound. He gave me a very censorious look and told me to email this guy he knew. I did email that guy, who is now my gifted and generous editor at Bookforum, Michael Miller, a model of how to read with humility and write with courage, who grants me extension after extension. And finally, I have to thank my family, especially Adam Boretz, who protects me and inspires me and is more beautiful than any book. Except, maybe, Nox. 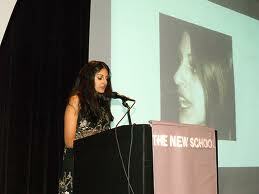 Read more about Parul Sehgal here. Find a pdf of her award-winning Balakian entry here.